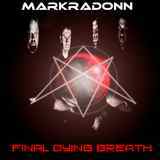 Ever since I have read the description of Markradonn EP Final Dying Breath and their to-be-continued concept I was intrigued. To describe the self-loathing of the suicidal man, to capture the last seconds of his life in a few tracks is an ambitious undertaking. To do it in the style of epic death metal and to include the real orchestral brass section is something I have not heard since Hollenthon, which happens to be one of my favorite projects. If Markradonn were to pull everything off, Final Dying Breath could have the potential to be Surprise of the Year for me. Alas, the seeds and the promise is all here, but some sound issues and in parts the lack of dynamics on the record held Final Dying Breath back for me just a tad. The stoic riffing and chorus on the self-titled opener, the medieval tournament beginning of Internal Hate Unbounded and the pompous, brass section loaded, instrumental No Redemption, No Forgiveness has the word "epic" staring you in the face. Markradonn skilfully builds from that foundation. Orchestration enhances plodding sense of doom in Internal Hate Unbounded, with periodic outbursts ripping through the fabric of this funeral procession. Guitars and keys solo, sowing more chaos into this structure, until doom budges, unveiling more horror within, exploding into the final exclamation point using French horn/trumpet. Markradonn has this tendency of self-winding, of ratcheting tension, via spinning noodling guitars atop the crushing rhythm section (self-titled) before acoustic closure takes over. Many elements of the EP are, in one word, unexpected. The opening drum solo on Frenzied Winter Sorrow is the combination of Flight to Venus and Moonspell. The most of Cathartic Spiritual Purgation is set to something salsa, Jamaican, African or anything else tribal beat, the unexpected ending to the album about suicide, until the belligerent guitar glides in and contorts everything else out of whack. At the same time, as much as woven in brass and something that sounds like hurdy-gurdy refresh Frenzied Winter Sorrow, there are moments on the song where its syncopated chords become static. And that is the feeling that, unfortunately, but once in a while, visits upon Final Dying Breath. The other negative is a snare drum sound in spots. Whereas it is fully appropriate on the unconventional Cathartic Spiritual Purgation, the bucket snare hits in the opener ruin the impression. When you are going for something of the magnitude Markradonn is attempting, I guess you should either go huge or go home. For the sheer amount of ideas presented on Final Dying Breath Markradonn deserves nothing but the highest marks. Could it be that the same amount of ideas that do not allow the EP to reach its pinnacle? I am more inclined to think it is the production and the execution at times, problems entirely correctable, so the future should be bright for Markradonn. PS. Very often in my selection of what to review I go for the less known bands, feeling that others would give more known bands their time and ink. Firing Squad pages in the old Metal Maniacs being not exactly the model, but something to resemble, I like reviewing self-produced releases. This may lead to my reviews not being well discussed on the forums, since not many people can get hold of these albums. At the same time, if something clicks in peoples' minds while reading my opinions of these independents, perhaps they can make an effort to seek the band out. #1: When I used the word "keys" I meant keyboards, but there were no keyboards played on this EP. No digital samples were used either, but Haniel Adhar plays guitar synth among many other instruments. #2: Searching for a reference describing Cathartic Spiritual Purgation I mentioned Salsa or Jamaican music. The actual ethnicity used is a combination of Indian and Australian Aboriginal music. (In all honesty I caught something unusual, but called it "tribal" instead). #3: I am no expert on specific types of percussion (just like I am not a professional musician or recording artist, period), so it was difficult for me to identify all types of percussion Markradonn is using on the EP. What sounded to me like an upside down "bucket snare" could actually be timpani. In some places they also have surdo and concert bass drum low in the mix, and on the last song Dennis is playing hand percussion. The opening hits on that track are on djembe, not snare. #4: There was no hurdy-gurdy played on this ep. In Frenzied Winter Sorrow there is a trumpet hitting a high note before the solo. Most importantly, Markradonn is very happy as to how the sound evolved on the EP. Where they were after the 90s demos sound + horns and timpani, I guess I expected a bit more polish, given the album wide ranging plethora of ideas.